After Hurricane Florence devastated North Carolina, thousands were left without power. Many came together, sharing goods and supporting each other through their losses. One entitled young woman chose not to though. 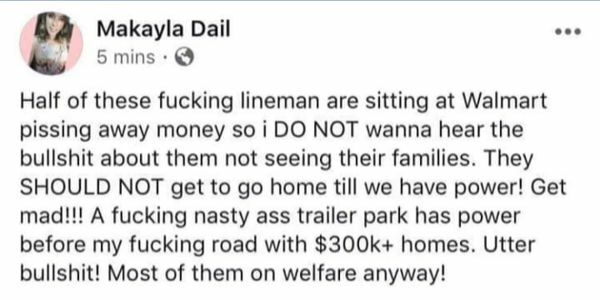 She complained about linemen going to Wal-Mart for necessities, she mocked her less well to do neighbours in a nearby trailer court, and was entitled and crude explaining why she felt she deserved to have power before anyone else. We think she's rotten and wrong and want the power company to serve the rest of the state but especially the trailer park she thinks is so nasty, first.